Let me get this out of the way first: I am not an artist. I don't pretend to be. And I'm not even sure that I know what art is. But a lack of artistic pretensions doesn't stop me from liking the look of leaded glass and as a woodworker it seemed likely that if I knew how to work with glass that opportunities might arise to do so. The first place I thought about using fancy glass was in the kitchen cabinets I was building for my home remodel. Having obscured glass as front panels in some cabinets has always been attractive to me and it seemed that if it were cut and assembled in an attractive pattern that it would be that much better. Thus motivated, I located a teacher at a local glass shop who offered beginner's classes a few times a year. The class itself wasn't terribly expensive but the actual course proved to be the cheapest thing involved. Materials are expensive. And tools, even simple manual tools, are even more expensive. 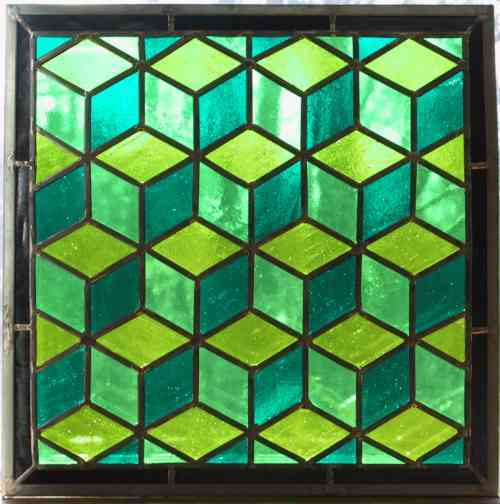 At our first class the students were given a basic primer knowledge of leaded glass and then told that we should pick out a design for our class work, a simple design, with not too many pieces and no little fiddly bits to get us into trouble. Being the sort of person I am I automatically ignored the advice and shunned the library of beginner's designs available for our use and set out to design my own pattern. I eventually came up with a design that contained at least four times the recommended number of pieces and, at 16" X 16" was larger than the recommendation. I also discovered later that I had also given myself some extremely fiddly bits to deal with. In creating the design I figured that having so many identically-shaped parts would be a great advantage. What I didn't realize was that having so many narrow angled pieces made for a design that would perpetually be trying to force itself out of shape by dint of the wedging action of the glass against the came (lead channels). Eventually it came together almost as desired although if you look closely you will notice that the right edge is bowed a bit. It could still be used in a window as it is since the edges would be covered pretty well by the window frame.